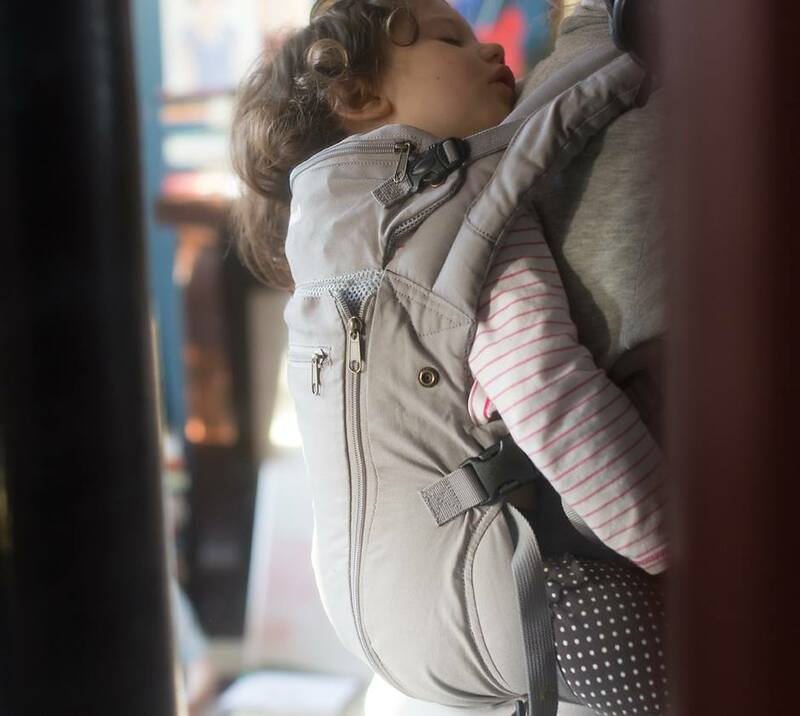 If you are new to the babywearing world or can remember when you were, it’s very likely you have wondered at some point WHY there are so many different brands of soft structured carriers (SSCs) when they all basically work the same and do the same job. And if you’ve tried a few on or talked to anyone who has, you’ve likely come to a similar conclusion: while they all are made in the same basic design, every brand is a little different, has some different features, and most importantly, FITS a bit differently than all the others. So when a new brand pops up we tend to just embrace it; you never know who will find this brand to be their absolute favorite fit! 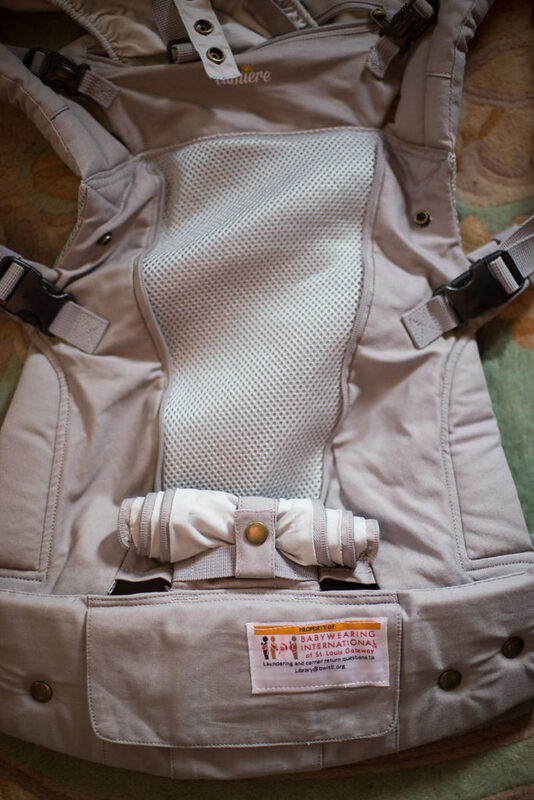 A small strap and snap on the shoulder to secure a purse or diaper bag strap – genius! Carrier shoulders always make the bag strap slip off! The panel width has a narrow, middle, and wide setting that easily adjusts by selecting the snap on each side of the waist band; this picture shows it snapped on the wide setting. The snaps are easy to adjust but secure; one time when I was hip-scooting my toddler I caught the edge of the panel as I scooted the waist band around and pulled the snap open. It was not a safety risk, but I did have to put her down in order to fix the snap and then start again. We have used the carrier for a couple months now and not had that happen again, so I’m calling it a fluke! My 3yo is about 30 pounds, so well within the weight limit, but I think she is on the tall side for this carrier. She definitely fits better in an SSC that is specifically toddler-sized, but we could use this in a pinch and she was both secure and comfortable for shorter rides (or naps!). In this picture you can see that I have the top of the panel folded up and clipped in place. With this piece folded down, I think the panel is not quite tall enough on her back. The zip-down panel reveals the mesh interior for warm days, and I like that it has a snap to secure it once rolled down. 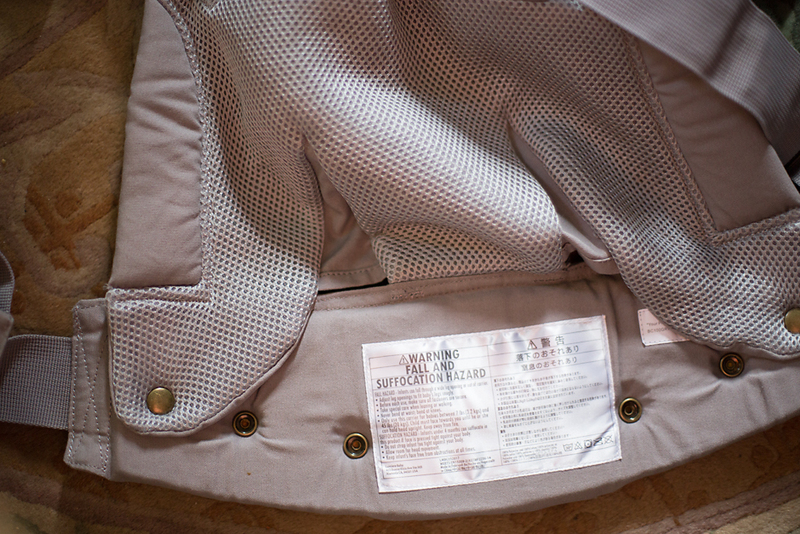 We haven’t had a chance to test it in the heat but these mesh panels tend to keep baby a little cooler. 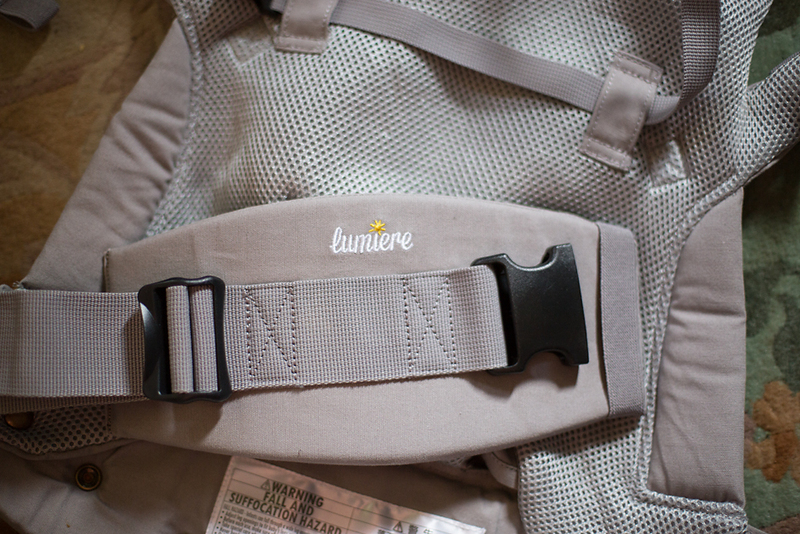 Another volunteer had the opportunity to try the Lumiere carrier with her 3-week-old newborn. 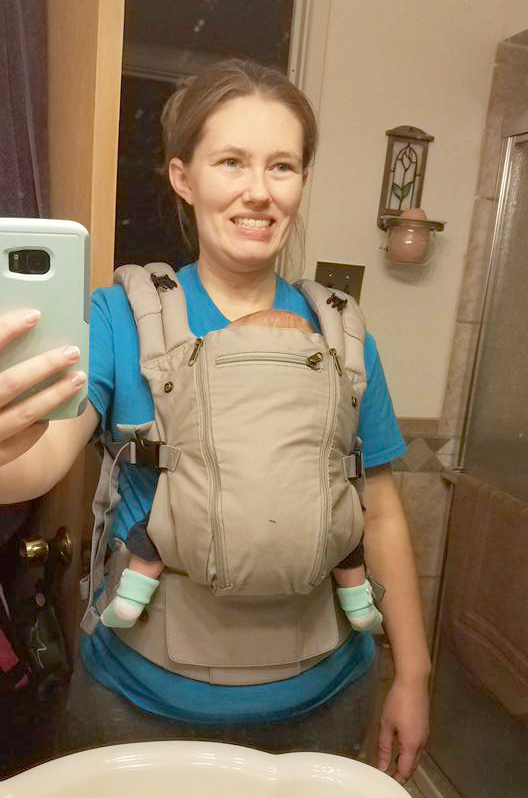 She was able to get her baby comfortably in the carrier but noted that she felt the panel size was still a little bit large at that point for an ideal fit. This is a great all-around SSC to try out, AND it is available on Amazon so it is easy to add to an Amazon wish list or baby registry. Pop into one of our free monthly meetings if you would like to try it out in person! Many thanks to Lumiere Baby for enhancing our carrier teaching and lending library with these carriers!